First up I always trawl the perfume shops and duty free shops for cheaper perfume and make up. This year I'm looking to find Clinique Airbrush Concealer for less than it is over here. Also I need to get some deodrant for my Dad (he has expensive taste in deodrant!) and the bf will be looking for aftershave. A couple of obvious ones- Mango and Zara. Yes, I know we have Mango and Zara over here too, but I always find nicer stuff in their homeland. How strange is that! I don't know if they have different stock for different countries? Or maybe I just have a better eye when I'm abroad? Mickey Mouse! And I love the bra. As I don't have the largest chest I can get away with thinner bras and this one looks very comfortable. I think the photos are very relaxed and pretty and I look forward to visiting their store again! I also love going to the department store El Corte Ingles. It's kind of a Spanish holiday tradition for me; when I think of shopping in Spain I think of El Corte Ingles. Most importantly for me, this is where you can get Pupa make up from(or at least you could, I hope you still can!). Pupa is an Italian make up brand and they have amazing cute compacts in the shape of teddy bears, ice creams etc. It's not amazing quality but I love the twee-ness. I'll also be scouring the markets and local shops. Getting very excited now! Sounds lovely! I hope you manage to come across some great finds! The lipbalm is just darling. Ooh I hope you have a wonderful time! 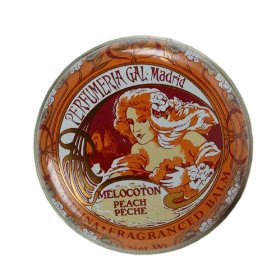 We just got the Perfumia Gal lip balms here in Australia and they're brilliant. Sometimes I think stores do have different stock in different countries - our Mango (we call it MNG here) has absolute rubbish whereas the overseas stockists always have really nice stuff! Sorry to get back to you so late. But an op shop is just an Australian word for a thrift store or charity shop. My blog contest result is weekend...hope you can drop by as I post the winner! Thanks f your entry sweetie! I'm a huge, huge fan of these lipbalms too, I love the one's by Agatha Ruiz de la Prada!! I think I have them all! !